Not all birds eat seeds, but all birds drink water. Birds need water to avoid dehydration and to maintain health. They are attracted to shallow dishes of water which provides them a place to drink and bathe. Bird baths are probably the best way to attract birds to your yard, even more so than bird feeders. Clean water is often the most difficult resource that birds must locate in order to survive. They use the water not only for drinking, but also for bathing which can cool their bodies during the heat of summer. Having water available is especially important in times of drought when birds may be stressed. If you can combine water, the appropriate wild bird food, shrubs and trees, and maybe even nesting boxes, your opportunity to attract wild birds will be greatly enhanced. 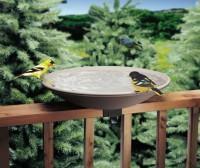 When placing you birdbath, find a location where the birds can see around the area. Housecats and other predators can hide in nearby cover. Thus it is best to position the birdbath in an open area where there are no hiding places for predators. It is advisable to change the water in your bird bath every few days to provide fresh, clean water. Change the water every day during hot summer months. Water that is exposed to direct sunlight may become stagnant and algae may grow. If you allow the water to sit for long periods of time, it will become less desirable for birds and will be much harder to clean. 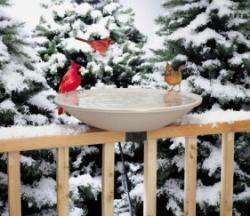 Several types of commercial birdbaths are available. Hanging birdbaths can reduce predation by cats. These birdbaths should be place in a tree with few branches so that birds have a clear view of the surroundings. 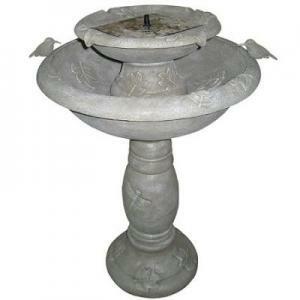 Pedestal birdbaths are the most common type of birdbaths. They can provide a nice centerpiece for your garden. Again, place the birdbath in and area where predators cannot hide. 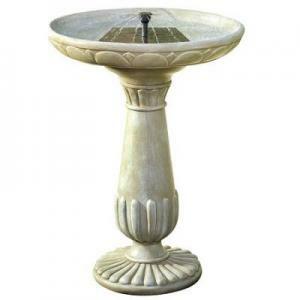 Solar bird bath use the suns energy to power a pump that can filter and keep the water moving. This dripping sound seems to attract birds. 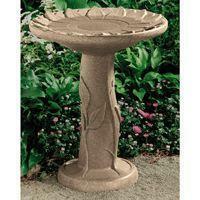 Grounded bird baths or bird ponds can be placed anywhere in your yard. Various models are available and can add beauty to your garden.